The Bermuda College Literary Society [BCLS], a student club “aimed at promoting literary consciousness on our campus and in our community,” is getting set to host Shanelle Gabriel later this month. 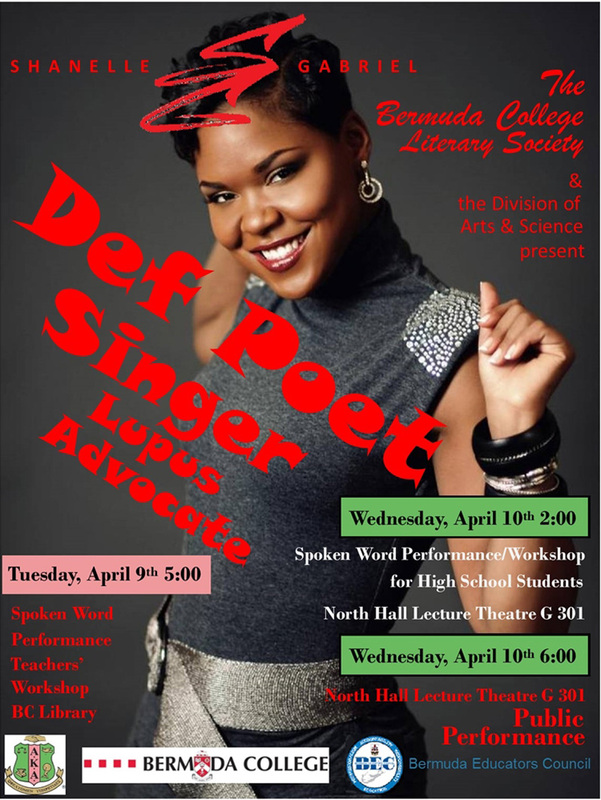 A spokesperson said, “As we have done every spring semester for the past several years, the BCLS, in conjunction with the Division of Arts & Science, are once again hosting a visit by a poet. “This year’s visiting artist is Ms. Shanelle Gabriel, Def Poet / Singer / Lupus Advocate. Shanelle is widely known for both opening and featuring on HBO’s Def Poetry Jam. She was recently named a “Powerful Indie Artist Activist You Should Know” by Blavity.com and one of “8 Millennial Feminist Poets That Deserve Recognition” by BET.com. “Shanelle was diagnosed with SLE Lupus. Using that as her fuel, she decided that she would pursue her dreams and encourage others who have obstacles in their path to do the same. “She has performed at numerous walks for Lupus, spoken at the National Press Room for the National Institute of Health, performed on Capitol Hill, and has been featured in several publications, including Women’s Health magazine, regarding chronic illness. “She presently tours the US and abroad, stays active with her sorority [Alpha Kappa Alpha Sorority, Inc], facilitates creative writing workshops, guest hosts the Friday Night Slam at the Nuyorican Poets Cafe, and she is also a coordinator for several youth development initiatives. Tuesday, April 9th at 5:00 p.m.-Bermuda College Library. While this workshop is for teachers, anyone interested is welcome.Wednesday, April 10th at 2:00 p.m. – 3:30 p.m. Performance/Q & A session for our island high school students.Wednesday, April 10th at 6:00-7:30 p.m.—Public Performance in the North Hall Lecture Theatre, G301.